My breed was developed in Germany a little more than 100 years ago in an effort to produce a hunting dog that could trail as well as point. My coat is short and lies close to my body, which makes grooming no problem at all. I am intelligent, easy to train, and I get along well with children, making me a good family pet as well as a more-than-competent hunting companion. I am an especially talented water dog -- some folks claim that I have webbed feet! When fully grown, I am between 21 and 25 inches tall (53.3 to 63.5 centimeters) and I weigh between 45 and 70 pounds (20.3 to 31.5 kilograms). We have no German Shorthaired Pointer Breeders listed at this time. 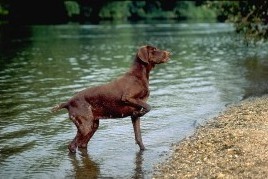 Click here to place your German Shorthaired Pointer Ad!